What’s something you should know about St. Louis that starts with the letter I? Well I think most St. Louis natives will point to Imo’s Pizza! But I’m guessing the interstates here get as much discussion and it seems like Ikea has grabbed the spotlight a bit too. So those will be the Is of St. Louis in this A to Z challenge. 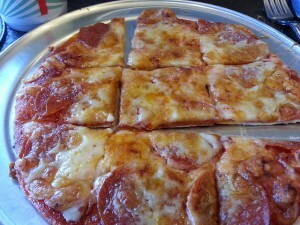 For people in the metro area, Imo’s Pizza is a neighborhood standard. There are dozens of Imo’s around town and it’s pizzas have come to define St. Louis pizza. So what is Imo’s pizza like? The crispy cracker-like crust is distinctive as is the fact they cut the pizza in squares rather than triangles (much like my beloved Broadway Pizza in Memphis though the toppings in Memphis are piled high). What really makes the St. Louis-style pizza stand out? To me, it is the use of a cheese called provel that I hadn’t heard of before. It is a processed cheese that is piled high at Imo’s and served on salads, sold at local groceries and more. St. Louis pizza is unique enough that NPR has written about it and provel. With the fact that St. Louis is the Gateway City, it is no surprise that there are several interstates coming together. Seems like they are already under construction for some sort of repairs. And with the number of people who live here, that means there is routinely a slowdown in traffic. That means there are lots of ways to get into or out of town! For the last few months, a lot of buzz around town is around the fact that Ikea is finally opening a store in St. Louis. I’m not sure I need an Ikea here but I do enjoy going to one now and then. The A to Z series about St. Louis is the focus of my blog in April. I have a lot of writing to do and lots of great things in St. Louis to highlight. Check out last year’s posts in my A to Z of Agriculture — I was about Irrigation, both Water Use and Conservation. Wow. Sorry that happened. Sounds like some real communications problems. Hope your weekend gets better. X is for Xylem -- Plants have vascular systems? And with xylem in them?